Nearly three-and-a-half years after it was first announced, Manaria Friends finally arrived at a time when it was desperately needed. We’re coming off The Greatest Year in Yuri Anime History, and to be honest, 2019 doesn’t look all that great in comparison, so we need all the yuri we can get. Luckily, this turned out to be even gayer than I thought it would be, but there is a caveat or two. First off, there isn’t much to the story. The show doesn’t do a very good job of explaining where we are of why we’re there (the synopsis actually explains it a lot better than the actual anime does), so we just mostly follow the two princesses around as they act all cute and embarrassed around each other. There really isn’t much more to it than that. We learn next to nothing of Anne and Grea’s backstories, nor do we learn about the world this anime is set in, so unless you’re a fan of the Rage no Bahamut mobile game, you know nothing about these characters from the outset, and the anime could’ve done a much better job of letting us get to know these girls better. Since there’s so little going on, it’s not really much of a problem, yet it still would’ve been nice to have the story be more fleshed-out than what it is, because right now, it’s bare-bones. Disc sales aren’t as important as they once were, but since Manaria Friends is selling quite well in Japan (thanks in no small part to Granblue Fantasy), maybe there’s a small chance we’ll get a proper follow-up that expands upon what we see here, because there’s still a lot more to explore of this world and it’s characters. Moving on to something more pleasant, I could mention how nice it is that Hanna is voiced by Nana Mizuki, or how amusing Lou is, or how Miranda’s “hobby” improves the quality of her character by 300%, but I won’t waste much time on them. Instead, this section should be about Anne and Grea. So I’ve already made it clear that the story is minimal, yet despite that, Manaria Friends still managed to be quite entertaining, and it’s all thanks to Anne and Grea. 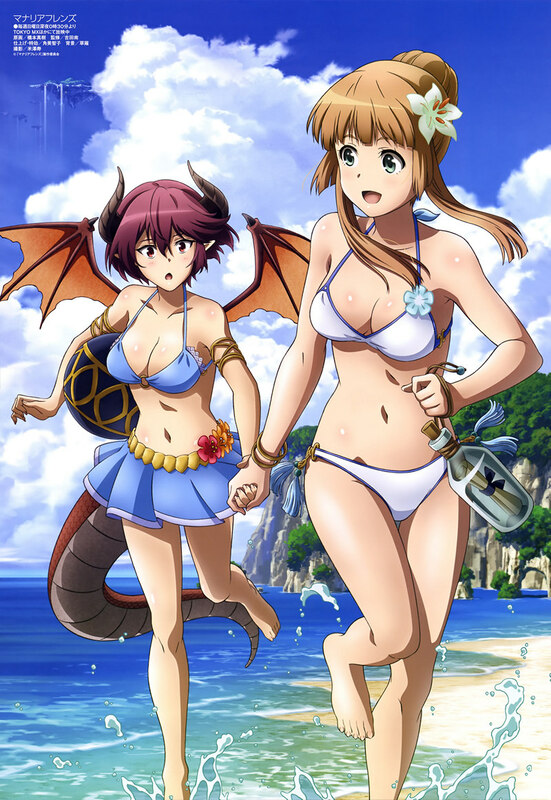 Complex characters with elaborate backstories are nice, but for a lot of people, just having very likable characters is enough, and Anne and Grea definitely fall into that category. No time is wasted having Anne and Grea first meet and get to know each other. Right off the bat, they’re already very close, and over the course of the remaining nine episodes, they just keep getting closer and closer. You know how someone usually is when they’re around the person they like? The blushing, the teasing, the body language, it’s very yuri anime-like, and I’m sure fans are going to love it. These two are practically like that all of the time, and it’s SO DAMN CUTE! While I enjoyed how amiable and playful Anne was, to me, Grea was the one that really stole the show, and even though it’s way too early to put much stock into it, she currently has a place in our annual Anime/Manga/Visual Novel Awards that will come at the end of the year. I loved how warm and gentle she was (despite being half-dragon), and she’s a perfect combination of cuteness and sexiness, so even though I liked Anne, I liked Grea so much more. 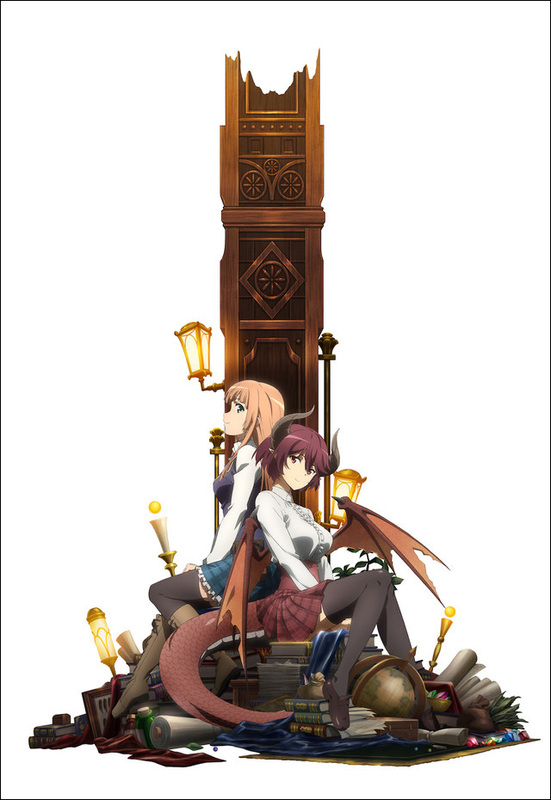 Even though Manaria Friends comes from CygamesPictures, a different studio than the one that brought us Shingeki no Bahamut: Genesis and Shingeki no Bahamut: Virgin Soul (that was MAPPA), the result is still the same: this is a good-looking anime. The lack of action keeps this anime from looking as good as it can look, but even without that, you can’t deny that Manaria Friends certainly isn’t lacking in production values. The character designs are nice (espeecially Grea’s), the backgrounds and settings reflect a cozy fantasy world that you can get lost in, and for those who are into that sort of thing, there’s a decent amount of fanservice to be found here, so the short-ish nature of this anime doesn’t mean that it’s a hastily slapped together project that’s devoid of eye-candy. Given the production problems this anime had, you gotta give CygamesPictures credit for still putting their best foot forward and producing an anime that can visually compete with some of the AAA series out there. And just as the rest of this anime is overly soft and fluffy, the music falls into the same boat, and it really did a great job of setting the proper mood for this anime. The music is lush and somewhat understated, yet it’s easy to notice how pleasant it is, and the sense of melancholy is through the roof. For how easygoing this anime generally is, the music just further accentuates that, and the original soundtrack ended up being one of the highlights of this anime for me. 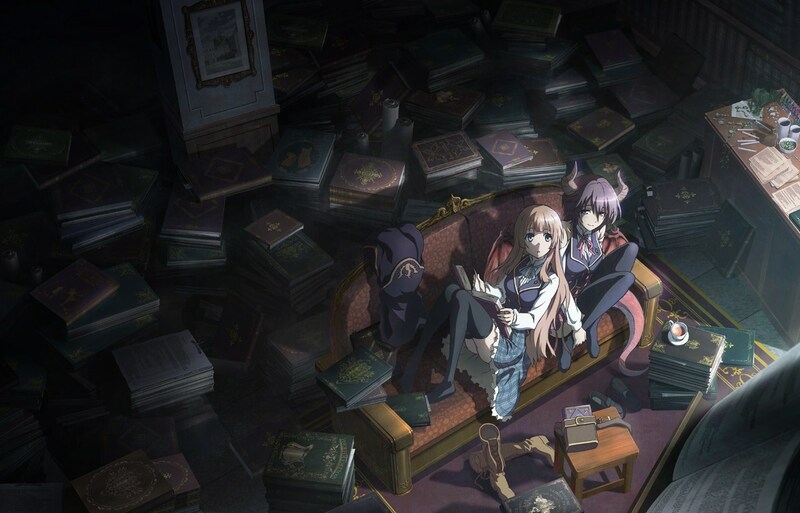 It’s not as action-packed as you might expect from an anime in the Shingeki no Bahamut universe, yet Manaria Friends is nevertheless a very worthwhile time for yuri fans. It’s a little frustrating that the relationship between Anne and Grea isn’t taken to the next level, because it’s very obvious from all of the subtext that this is basically a yuri anime disguised as a non-yuri anime, and even though they might not be canon, they really should be. This entry was posted in Anime, Anime Review and tagged Manaria Friends by Rock The Vogt. Bookmark the permalink. My #1 anime of Winter 2019 and one that already has a spot in my Top 3 of 2019. Anne and Grea are worthy successors to Fine and Izetta. Their love is beautiful and pure. No strings attached whatsoever. Just what I wanted. Hanna and Poppy were a cute side-couple as well. Here’s hoping we get a 2nd season in the near future. I want more. Much more. WE NEED A 2nd SEASON! I don’t want to spend money on Granblue Fantasy to get them and watch their events there (Even though I’m trying to do it without spending money). You know how evil gacha is. The only issue I had is a bit of feeling disconnected from the many side characters and world at large since I’m not familiar with the original source material. It kind of kept me from being fully immersed in the story as much as I wanted to be. It was a very cute and sweet anime, but to be totally fair… Anne acted like a creep one too many times. You might want to check out this OVA series next.